A topographic map sheet of a part of the Iani Chaos region on Mars, based on image data obtained with the High Resolution Stereo Camera (HRSC) on board ESA's Mars Express. 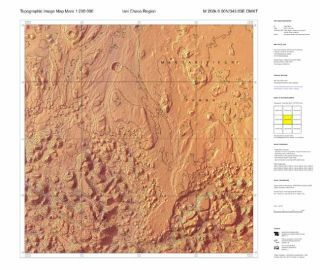 Such 'Topographic Image Map Mars 1:200 000' has been designed as an example of a possible standard map series for the HRSC experiment. When spacetravelers finally traipse across the dusty Martian surface, they'll knowjust what kind of terrain to expect thanks to scientists at the European SpaceAgency who are producing the first "hiker's maps" of the red planet. The newtopographic maps, based on data collected by the ESA's MarsExpress spacecraft, could become the standard cartographic reference forfuture Martian research, as well as explorationon foot. The ESAeventually will create topographic maps for the entire surface of Mars, which would mean more than 10,000maps each of equal area. Forstarters, researchers have created a map of the Iani Chaos region, chosen forthe rock "islands" that litter the landscape in an interesting,chaotic pattern. These rocks are likely the remains of a previous Martiansurface that collapsed when the icesupporting subsurface cavities melted from volcanicheat. All the mapswill feature the names of geologicalfeatures and detailed height contours of the landscape. Contourlines are superimposed onto high-resolution images of Mars taken by theHigh-Resolution Stereo Camera (HRSC) onboard Mars Express. The lines help theeye to follow the morphology of the surface. The data havealso been transformed into 3-Dcomputer models of Mars's surface.